The Superman Fan Podcast: Episode #384 Part III: Superman Comic Book Cover Dated July 1965: Action Comics #326! 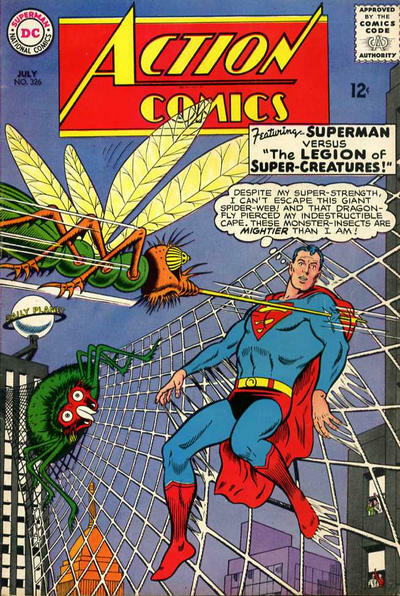 I vividly remember having read "The Legion of Super-Creatures" as a boy, and I still enjoy it now. I do find it odd that the Phantom Zone projector didn't work against the creatures. Usually, such a failure of the projector was explained by interference due to sunspot activity or the like, but here, it simply didn't work. It was also an amazing stroke of luck that the orange Giantite followed him back to Earth. Apparently, large planets under a red sun turn into a radioactive element deadly to life native to that planet, once the planet explodes. Silver Age science, I guess. As for Superman's costume, it was generally explained in the Silver Age, as you surmised, that Kryptonian material of any sort (metal, cloth, etc. ), that left Krypton before it exploded (thus avoiding the transformation into kryptonite), would become indestructible under the influence of a yellow sun, but not under red solar radiation, as when Superman visited Kandor. I find it interesting that Superman was so fashion conscious that, even though he expected that Earth would be destroyed by the unstoppable creatures, and nothing he could do would stop that, he took the time during his trip back to Earth, to mend his costume. I guess if you expect to be the last living man on Earth, you might as well look good.